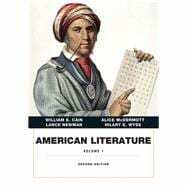 by Cain, William E.; McDermott, Alice; Newman, Lance E; Wyss, Hilary E.
American Literature Volume 1, offers a wide range of selections (with minimal editorial apparatus) at an affordable price. This new edition of American Literature presents an exciting opportunity for readers. Many of the pieces will be familiar to readers of American literature, but we have also taken steps to include selections that are not as well known and just as compelling. Making this new edition even more attractive are six thematic clusters of excerpts from documents illustrating key trends in American social and literary history; a richer selection of images; and a new page design to enhance the reading experience. William E. Cain is Mary Jewett Gaiser Professor of English at Wellesley College. Among his many publications is a monograph on American literary and cultural criticism, 1900-1945, in The Cambridge History of American Literature, Vol. 5 (2003). He is a co-editor of the Norton Anthology of Literary Theory and Criticism (2nd ed., 2010), and, with Sylvan Barnet, he has co-authored a number of books on literature and composition. His recent publications include essays on Ralph Ellison, Ernest Hemingway, George Orwell, Shakespeare, Edith Wharton, and the painter Mark Rothko. Alice McDermott is the author of the forthcoming novel Someone and six previous novels, including After This; Child of My Heart; Charming Billy, winner of the 1998 National Book Award; and At Weddings and Wakes, all published by Farrar, Straus and Giroux. That Night, At Weddings and Wakes, and After This were all finalists for the Pulitzer Prize. McDermott lives with her family outside Washington, D.C.
Lance E. Newman is Professor of English and Environmental Studies at Westminster College in Salt Lake City, where he teaches Early American Literature, Environmental Literature, and Creative Writing. He has also worked as a river guide for more than two decades, leading rafting trips in Southeastern Utah and in Grand Canyon. He is the author of The Grand Canyon Reader (University of California Press, 2011) and Our Common Dwelling: Henry Thoreau, Transcendentalism, and the Class Politics of Nature (Palgrave, 2005). With Joel Pace and Chris Keonig-Woodyard, he co-edited Transatlantic Romanticism: An Anthology of British, American, and Canadian Literature, 1767-1867 (Longman, 2006). He co-produced the documentary film Canyonlands: Edward Abbey and the Great American Desert (2011) with Roderick Coover. Newman’s poems have appeared in many print and web magazines, and he is the author of two poetry chapbooks, Come Kanab (Dusi-e/chaps Kollectiv, 2007) and 3by3by3 (Beard of Bees, 2010), both available free on the Web. Hilary E. Wyss is Hargis Professor of American Literature at Auburn University, where she teaches courses in early American literature, American studies, and Native American studies. She is the author of over a dozen articles and book chapters as well as three books, including English Letters and Indian Literacies: Reading, Writing, and New England Missionary Schools, 1750-1830 (University of Pennsylvania Press, 2012); Early Native Literacies in New England: a Documentary and Critical Anthology (University of Massachusetts Press, 2008, co-edited with Kristina Bross); and Writing Indians: Literacy, Christianity, and Native Community in Early America (University of Massachusetts Press, 2000). She has won teaching awards at Auburn University as well as national research grants to support her work. She has served on the editorial board of the journal Early American Literature and was most recently the President of the Society of Early Americanists.